The link goes to Ashi-Dhulu. Also, recall that his power is very similar to Mindflayer's SA. True, but I'm not a big fan of that one for the same reasons. Nothing particularly wrong with it either way. I am sad to say that @hivelord has stepped down from his position as SoV Judge. He has been with us for some time and we all appreciate his contributions. His presence will be missed. Normally when a Judge moves on we pick another Judge to take his place. However, at the current time the SoV team feels we can handle the current workload without finding a replacement. If the backlog increases too much we may increase back to eight Judges, but for now we will operate with seven. Which means that it now only requires four Yea votes to accept a unit for review. Thus, Urk has been accepted for review and moves forward in the process. Its sad to see hivelord leave. Thanks to the SoV for all the votes and comments on Urk. I hope he shows promise in playtesting. I would like to nominate my custom, Elgos Knights, for consideration by the SoV judges. 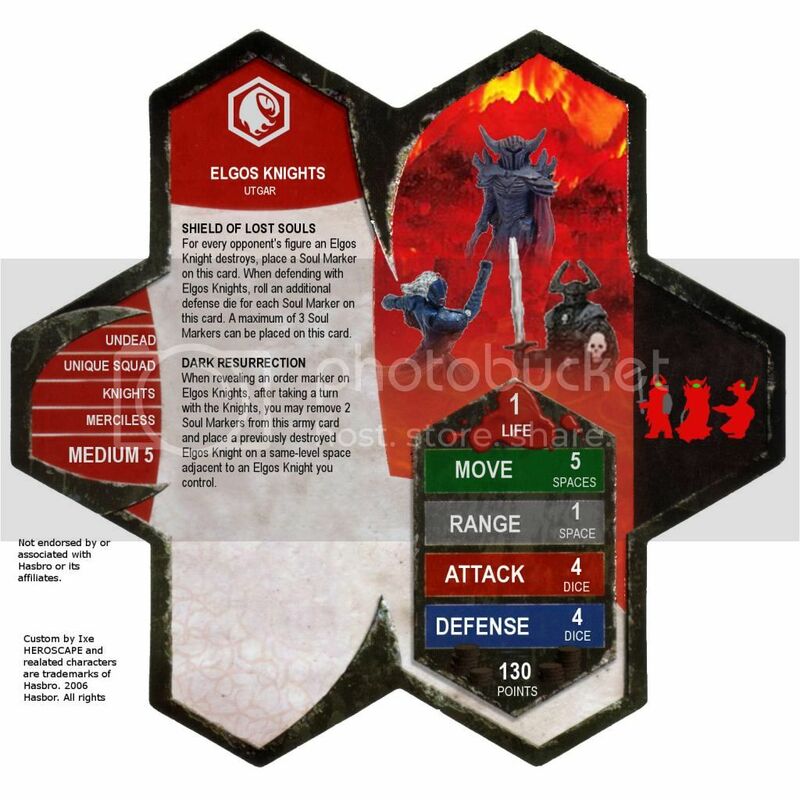 Balance The Elgos Knights are a Unique melee squad in a similar class as the Tagawa Samurai. They can potentially achieve great feats when they get rolling, but other times will lose too much momentum from early losses and not amount to much. There is always the hope for them to claw back, however. Playability Elgos Knights can be death incarnate in battles, withstanding attacks with their Shield of Lost Souls and reclaiming those that died with Dark Resurrection. Other times they don't quite get rolling and suffer the vulnerabilities of a unique squad. They have a few options for play, but their last power means that they almost always have a chance to claw back from death and pose a threat. Creativity The Elgos Knights present a rare example of some resource management within Heroscape. They have the potential to spend Soul Markers to reclaim previously destroyed figures, but most do so at cost of making themselves more vulnerable. Theme The Elgos Knights resonate a theme of dark knights who harvest the souls of those they slay and can use that to empower their defenses or in rituals to reclaim their dead. For their back story, their name betrays their original purpose. They were once a knightly order for an ancient civilization to their world, sworn to protect the souls of all they served. However, as time went by, their purpose twisted as they began to see their continuation more important than anything else. Their name ("El" referring to guard and "gos" meaning to spirit) twisted from them being defenders of souls to using that very life-force to protect them instead. The Eglos Knights hail from Feylund. 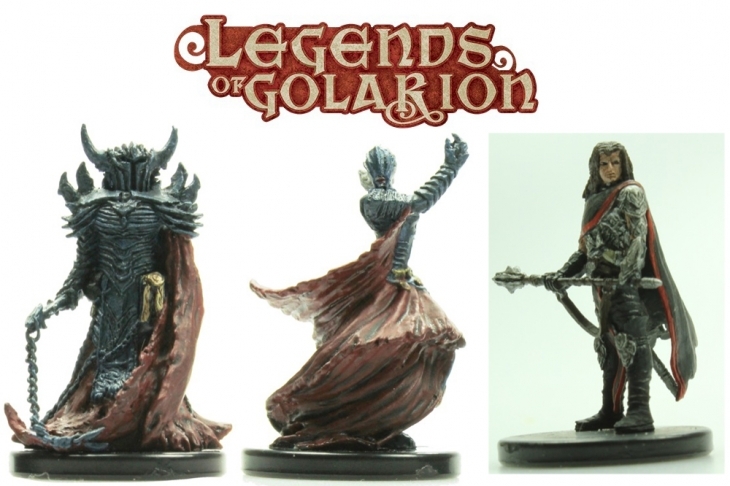 Availiability Upon a previous inquiry to unit availability at Paizo, the Hellknight Signifier and Hellknight Scourge from Pathfinder Miniatures Legends of Golarian were stocked at 201 and 145, respectively. The Dread Guard from D&D Miniatures Arch Fiends has dipped in availability of late, although I was still able to drum up 70 of them online. [EDIT] Back again to soul markers. Sticking with it. [EDIT] Heard back from paizo on Dread Guard. I can't quite decide how I feel about the card as a whole. The one miniature with the swirly cloak doesn't quite fit with the others, in my opinion. I'll have to think about it some more, though. I love the Soul Marker mechanic, but unfortunately for you Soul Markers already exist, on Akumaken. So I'm gonna turn them down right now. 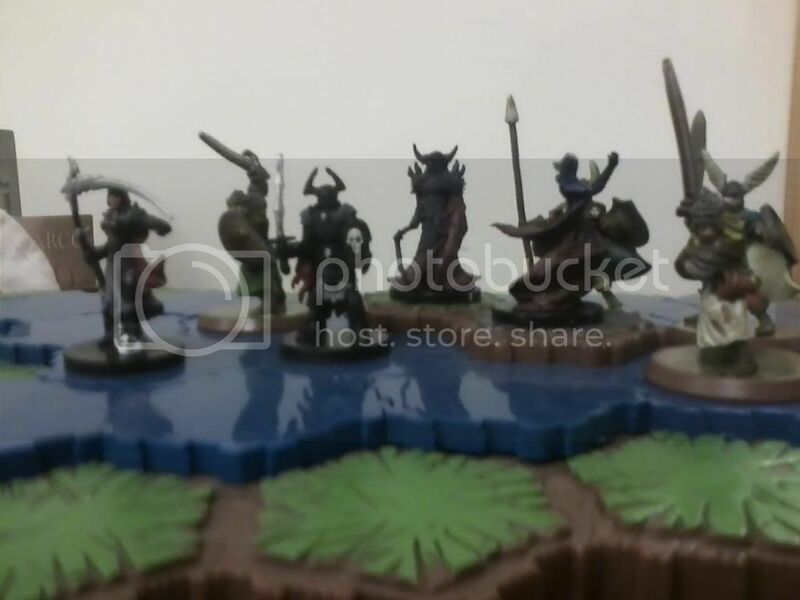 I'd like to see them again, maybe with different miniatures, if those are available. EDIT: I don't see the name, either. Could you explain the "El" and "gos" parts more fully? To me, "El" always means God, not guardian. The swirly cloak miniature (the Hellknight Signifier) actually looks a lot better in context. HERE is a picture of it next to the Scourge. They're very much intended to group together well. For whatever that's worth. Thanks for the picture, johnny139. My argument for their appearance is that they are a Unique Squad and can have a little more leeway on that basis. Here is a picture of them alongside the Tarn Viking Warriors (who are all very distinct looking). Ignore the Cleric of Nerull (that one was cut out for not looking right). I can't remember where exactly I got the "El" connection to defender, but I believe I derived it from Elmo, which is an Italian name of Germanic origin meaning "helm or protection." Gos was more of a play on ghost, or spirit. It is not necessarily intended to be from literal lingual origins and more related to the fantasy world they come from. As for Soul Markers, their design predates Akumen's release. If necessary, I would not be opposed to changing the name (although it was unfortunately spot on). @Ixe - Instead of adding a new marker to the mix, why not just put the destroyed figures on the card? I'd rather not since that changes how the power interacts with other figures like the Viking Champions in ways that I do not intend. Any adjustment to Soul Markers will be a non-functional name change, but only if it's necessary. I can see it both going both ways since they are acquired in the same way and are only used differently. On one hand it's not a thematic stretch that different units can use the same resource differently, while on the other it's probably best to have consistency in what markers do for the sake of clarity.